Philippa Gregory has once again brought to life the corrupt world of the fifteenth-century English monarchs in her latest novel, The White Queen. This is the first book in her Cousins’ War series that historically leads right into her books about the Tudor Court. In The White Queen, Gregory takes us inside the War of the Roses, where England was battling against itself in order to find the “true king”. It is the story of a commoner, Elizabeth, marrying the York king of England. The wedding ceremony was done in secret, and many believe Elizabeth has placed a spell on the king; it was widely known that Elizabeth’s River ancestors were witches. The rest of the story is about the York house’s efforts to keep control of the country and out of the hands of the house of Lancaster. To me it was refreshing to see a happy royal couple in Gregory’s novel; there was no corruption between the king and queen. There was, however, enough plotting and scheming within the house of York to keep me eagerly turning the page. I also enjoyed the hints of magic that surround the queen due to her water goddess ancestor. Gregory adds a bit of folklore to her story when talking about Elizabeth’s ancestor Melusina, which as a reader I found to be a nice side story. All and all, it was another great piece by Gregory. Look for the second book in the series, The Red Queen, coming out August 3rd of 2010. Our next book club meeting will be August 7th and we will be discussing Freakonomics and the sequel Superfreakonomics by Steven D. Levitt and Stephen J. Dubner. This is a non-fiction book that explores the world through economics. It sounds like a dry subject, but the authors do a wonderful job of making the subject entertaining. This is the type of book that will make you go, “huh….how very interesting.” If you would like more information about Freakonomics, check out our review on June 3rd. August 21th we move on to discuss A Reliable Wife by Robert Goolrick. This is a work of fiction about a man who places an ad looking for a wife, and the woman who answers the ad for sinister reasons. This should be a fun suspenseful read. Our book clubs start at 1 p.m. here in the store, and as always, everyone is welcome. Another wonderful read to check out this summer is The Guernsey Literary and Potato Peel Pie Society by Mary Ann Shaffer and Annie Barrows. This story takes place shortly after WWII on the Guernsey Islands off the coast of England. Juliet receives a letter from a founding member of the Guernsey Literary and Potato Peel Pie Society inquiring about a book, and soon the two are writing each other letters and learning how others lived through the war. This book is written in a very unique way, instead of the traditional story telling narrative that includes dialogue, the authors decided to write the letters that the characters were sending to each other. This means the entire book is in letter format, what a fun way to read a book! I was originally nervous that the letters would end up hindering the story, but instead I was amazed at the amount of character development that occurred through the letters. I also felt more connected to the characters since letters are such personal writings. Needless to say, this has become one of my favorite books to read. My co-work just started reading Terminal Freeze, by Lincoln Child, and is loving the story. This book is full of Native American folklore and of course, page turning suspense. Evan Marshall travels up to Alaska to study climate change, but he soon discover a creature that has been buried in the ice. The company backing Marshall have decided that he has to dig the creature out of the ice. However, Marshall is feeling apprehensive about doing this, especially when all of the locals are telling him to leave the creature alone. And, to make matters worse, a case file has be discovered entitled “Fear”, and everything within seems to be talking about a discovery on the top of the world. I have been told this is a great read. My co-worker was clearly excited to get back to reading it, giving me the impression it was a hard book to put down until the reader reaches the end. Those are the best kinds of books. I made the mistake of starting this book before I went to bed – you got it, didn’t get to sleep until the book was finished. Ali Reynolds, the ex-TV anchor who lost her job and started a blog, not going back to TV journalism; keeps getting caught up in murder. She has moved back to her home town of Sedona AZ and her contractor is accused of murdering his wife. Ali does everything she can NOT to get involved; to no avail. I love her restaurant owning parents (home-style cooking) especially her Mom, who solves every situation with cooking comfort foods. The story just flows beautifully. J.A. 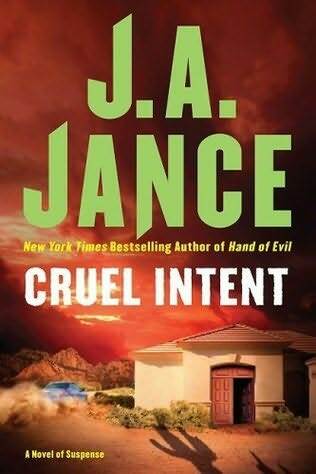 Jance and her characters just keep getting better and better, but this one is a don’t miss. Don’t forget, J. A. Jance will be doing a book signing August 9th at 7 p.m. here at the store. Her newest book , Queen of the Night, will be coming out on July 27th. Okay, here is something we all struggle with, how long do we have to read a book before we can officially say that it isn’t the book for us? And of course, someone has actually come up with a way to determine the proper amount of pages for you to read. Here is the rule – Subtract your age from 100. If the book isn’t good by the time you reach this number of pages, you can stop reading. This is great because as you get older, you can commit to less pages! I have just started reading the new series, Soul Screamers, by Rachel Vincent. The first book in the series is My Soul To Take, and it was a breath of fresh air from all of the young adult vampire books that are currently out. Instead, this series is about a sixteen year old girl who finds out she is a banshee, or to be more accurate a “bean sidhe” which is Gaelic for “woman of the faeries”. Kaylee has been having premonitions of teen girls who are about to die. The worst part is that her visions are coming true, and for some reason she has an urge to scream whenever a premonition occurs. Thankfully, Nash has been able to calm her during the episodes, but more and more girls are dying for no apparent reason. Kaylee knows that she must get to the bottom of this, and while she is trying to save her high school classmates she learns all about her family’s secrets. I have to say I did enjoy this book; Vincent created a suspenseful tale that kept me turning the pages until the exciting conclusion. I also like that her banshees worked together in pairs, male and female, in order to save souls. I thought this was a nice addition to the banshee folklore. Now, I am looking forward to reading the next book in the series, My Soul to Save.